Obituary – Shoop, William “Ernest” « Perry High School Alumni Association, Inc.
Funeral has been scheduled for 2 p.m. Saturday at the First Christian church for Ernest Shoop, 89, 1111 Thirteenth street, who died Thursday at St. Mary’s hospital in Enid. Rev. M. R. Work, pastor, will officiate. Burial will be at the Polo cemetery under direction of Parker Funeral home. Shoop was born Oct. 27, 1887, at Linn Creek, Mo., the son of Wilson and Ellen Chistian Shoop. 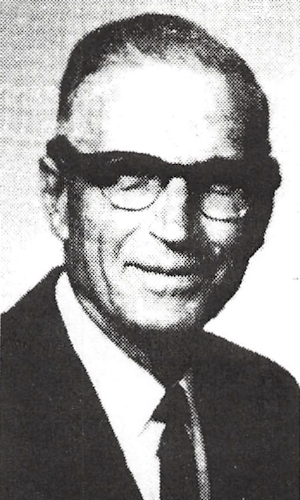 He was employed in Indian service for 17 years, had been a Noble county rural school teacher and was superintendent of Noble county schools from 1946-83. He was a 1909 graduate of Perry high school and was a graduate of Oklahoma State university at Stillwater. Shoop was married June 29, 1913, at Garber to Ethel Pfrimmer, who survives. He was a member of the First Christian church. In addition to his wife, of the home address, Shoop is survived by a son. Garth, Santa Barbara, Calif.; one granddaughter and two great-grandchildren. The family has suggested memorial contributions to the Heart fund or the First Christian church.